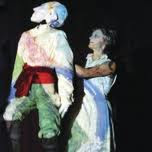 I'm not entirely sure why the main character, Joseph, in Aurora Theatre's new theatrical adaptation of Stravinsky's 1918 chamber music work The Soldier's Tale needs to be played by a puppet rather than a human actor. But what I appreciated about yesterday's opening night performance was being able to watch the skills of Joseph's deft puppet master, Muriel Maffre. Aurora's thrust space is very small and I had a seat in the middle of the second row so could observe Maffre at close range. She's a startling performer. I had known her for years as a principal dancer at the San Francisco Ballet. Until last night, I had no idea that she could manipulate the body of an otherwise inanimate marionette as expertly (in the relative sense of course) as she moves her own body. Maffre used careful movements. There was a spareness to the way in which she walked Joseph around the stage that belied the complexity of the emotions that she was able to put across. I also loved the way she used her face to respond and register a wide variety of moods and emotions. The puppet seemed extremely lifelike as a result. It's amazing to pay a visit this web page and reading the views of all colleagues on the topic of this article, https://www.rebelmouse.com/andypreisler/nanowrimo-is-coming-10-proven-tips-to-get-prepared-1429924319.html while I am also zealous of getting knowledge.